Advanced Centre for Treatment, Research and Education in Cancer (ACTREC) invites applications for the recruitment of Project Scientist, Student, Trainee vacancies. Those Candidates who are interested in the vacancy details & completed all eligibility criteria can read the Notification & Attend Walk in. 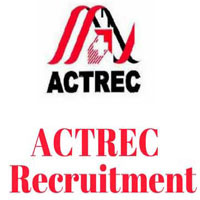 Applicants who have completed Degree or equivalent from a recognized Institute for ACTREC Recruitment 2019.